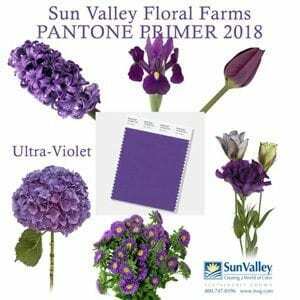 Last week the venerable design firm unveiled its new pick, “Ultra Violet” (Pantone 18-3838), to much applause from the floral industry professionals. According to Leatrice Eiseman, the Pantone Color Institute’s executive director, the “complex and contemplative” purple — symbolic of counterculture, unconventionality and artistic brilliance — reflects consumers’ desire to leave their unique mark on the world. The months-long process of pinpointing a color for 2018 was similar to efforts in years past. Pantone’s meticulous decision resonated with Jaclyn Gough, who reflected on a year punctuated by natural disasters, scandals galore and the constant threat of nuclear war with North Korea. She’s excited to explore the color’s many applications in the floral world. The selection drew a sigh of relief for Laura Daluga, AIFD. Ultra Violet is ultra useful, she said, noting that it mixes equally well with vibrant tones (chartreuse and fuchsia) and moody shades (navy, forest green and charcoal). “I can’t wait to get my hands on some monkshood, hyacinth, iris and vanda orchids,” she said. Victor Romero, a designer with Peoples Flowers in Albuquerque, New Mexico, has seen violet shades grow increasingly popular in the hair and fashion industries in recent years. 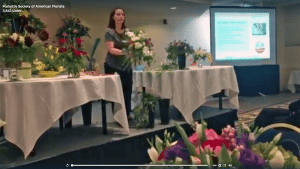 Jessica Cosentino, AAF, is thrilled with the sheer volume of Ultra Violet flowers in the market. In years past, the manager of Cosentino’s Florist in Auburn, New York, struggled to find buds that matched the Pantone pick. 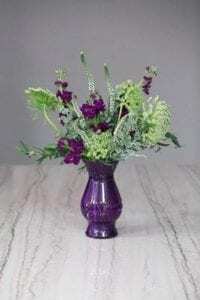 Other florists noted that the color’s preexisting popularity should make Ultra Violet designs easy sales. “I don’t know whether it’s the calming blue or the fiery red undertones driving demand, but people are passionate about purple,” said Lisa Greene, AAF, AIFD, PFCI, manager of Beach Blum Too Flower Shop in Newburyport, Massachusetts. She plans to host a “Purple Craze for a Gray Day” design class next month. Robbin Yelverton, AAF, AIFD, PFCI, echoed Greene’s observation. “Purple, in all its tints and tones, has always been a hit here in Detroit,” said the co-owner of Blumz…by JR Designs. He anticipates using a lot of purple stock, ‘Moody Blues’ roses and Florigene’s Moon Series carnations in the coming year. “I think Pantone nailed it,” said Dwight Larimer, AAF, PFCI, president of Design Master color tool inc., in Boulder, Colorado, which specializes in color forecasting and developing products that coordinate with emerging trends. “We’ve been watching ‘moody hues’ grow in popularity and presence, and Ultra Violet is the consummate ‘moody hue’,” he said. In fact, Design Master offers several products that match it: 740 Purple and 715 Violet in its Colortool line, 138 Purple Pansy in its Just For Flowers line, 537 Plum in its TintIt line and 557 Wisteria in its übermatte line.